Zenith's love of their legendary automatic chronograph movement is palpable in the El Primero Chronomaster collection. Top models in the series feature a tourbillon or a combination of a moon phase display and day/night display. The Zenith El Primero Chronomaster collection is comprised of many timepieces with different designs, all tied together by their common use of the famous El Primero caliber. The movement was first introduced in 1969, though its development began in 1962. It made history as the first integrated, automatic chronograph caliber. Other manufacturers took advantage of this caliber: Rolex modified it to their needs, renaming it Caliber 4030, and used it in the Daytona. Today, the movement is still considered ultra-precise. After all, there's a reason the El Primero has a reputation of being Zenith's most powerful caliber. It has a balance frequency of 36,000 A/h (5 Hz) and allows you to measure 1/10th of a second. The series, first introduced in 1994, is known for its diversity of designs. Classic variants with the original case from 1969 are grouped together with models featuring almost completely skeletonized dials, which give you a view of the movement at work. There is also a wide variety of case materials used: You have the choice between rose gold, stainless steel, and durable ceramic. The sizes of the timepieces range between 38 and 45 mm, with the bigger versions being more suitable for larger wrists. The Zenith El Primero Chronomaster series excels when it comes to complications. For example, the series includes chronographs with a tourbillon or moon phase display. Many models also have a tachymeter scale, which is an attractive extra feature. 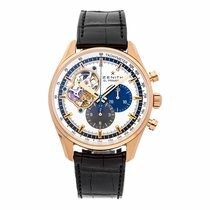 How much does a Zenith El Primero Chronomaster cost? Models in this series are comparatively affordable when you consider their quality. This is in part due to the manufacturer's pricing policy, which insists on fairly pricing their high-quality timepieces. 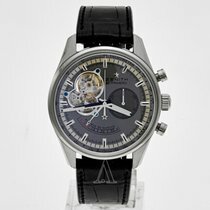 A new, stainless steel, automatic El Primero Chronomaster 1969 (03.2040.4061/69.C496) costs 6,500 euros. A rose gold case ups the price to 14,000 euros. The Super-LumiNova-coated hands and indices guarantee you can easily read the watch at night as well. If you prefer a similar version with a smaller case and closed dial, then you should take a look at the El Primero Chronomaster 38.00 (03.2150.400/69.C713). Powered by the El Primero 400 caliber, this model has a small seconds at nine o'clock, a 12-hour counter at six o'clock, and a 30-minute counter at three o'clock. New, it costs 5,000 euros. If you prefer a version with a moon phase and date display, then consider the El Primero Chronomaster Open Grande Date . The skeletonized movement combines a moon phase and day/night display via two stacked discs which simultaneously display the moon phase and time of day. The version with reference number 18.2160.4047/01.C713 has a rose gold case and costs around 18,500 euros when new. The same model is available with a stainless steel (9,000 euros) or bicolor case. Zenith has something for women in this collection, too: The Zenith El Primero Chronomaster Open Lady 38.00 is a refined, elegant watch featuring diamonds on the oval bezel and a mother-of-pearl dial. You can view the El Primero at work through the opening between nine and 12 o'clock. The El Primero Chronomaster Open Lady (16.2150.4062/91.C760) has a stainless steel case and displays the time on a satinized, slate-gray dial. Paired with an alligator leather strap, a new timepiece costs 8,000 euros. The same timepiece with an 18-karat rose gold case (22.2150.4062/91.C752) costs around 15,500 euros new. An exclusive model in this collection is the Zenith El Primero Chronomaster Tourbillon GFJ. The letters GFJ are in honor of Zenith's founder, Georges Favre-Jacot, and the timepiece was introduced in celebration of the company's 150th anniversary in 2015. With a completely skeletonized dial, you get a clear view of the movement and tourbillon, turning it into a real eye-catcher. What makes this watch special, however, is its fusée-and-chain transmission, which ensures a high level of precision. The El Primero Chronomaster GFJ in rose gold (18.2520.4805/98.C713) measures a stately 45 mm in diameter. The brown alligator leather strap rounds out the watch's look perfectly. New, this version costs around 70,000 euros. If you're more of the sporty type, then the Chronomaster Tourbillon GFJ with reference number 49.2520.4805/98.R576 is a better choice. It has a black ceramic case, a matching black rubber strap, and costs around 65,000 euros when new.